Good morning everybody. It’s an honor to be here, to welcome new students to the college and to the new academic year, to welcome the brand new faculty members joining us today, and to welcome back returning students, faculty, and staff. I know all of you out there in the Class of 2021 and the transfer students from other class years have heard a chorus of welcomes lately. I hope the one I’m about to offer can add a little bit of a new angle. So here’s what I’m going to do- to get started, I’ll tell you about just seven of the many posts that have shown up on my social media feed and in my e-mail over the summer. First, a fellow sociologist shared a blog post she wrote that has 14,000 likes on Facebook, with 21 tips for the incoming college Class of 2021. They’re great tips, I’d love to read them all to you right now, but I’m headed somewhere else with these anecdotes, so please just bear with me for a bit. I also had beautiful summertime photographs come my way, from someone with a remarkable eye; she sent close-ups of freshly picked strawberries and haunting images of pathways through the deep woods, composed to draw the viewer into an appreciation of the vibrancy of the world around us. In another post, an activist environmental writer sent news of her recent invitation to give a TED talk about the toxic legacy of plastics, sharing the excitement and also the fear inspired by the chance to engage such a critical public health issue both live and for a potentially endless digital audience. I had an update from a talented writer, who told me about some very difficult life questions he’s been struggling with, and their intersections with long conversations he and I have had in the past; this e-mail brought me to tears through the honesty, vulnerability, and piercing insight of the writing. I also heard from a scholar-activist who studies political violence, who asked me to contribute to a bank of resources to help faculty advocate for undocumented students at this time of alarming changes to US policy, a resource bank they updated again in August in the aftermath of white supremacist violence in Charlottesville. Another post included adorable pictures of a 3-year-old throwing out a pitch and high-fiving Slugger the mascot at a Portland Sea Dogs minor league baseball game, just one of many amusing summer adventures for this special kiddo’s family. And the final one I’ll share this morning is an update I got about a fellow sociologist’s keynote address at a conference promoting equity in the construction trades, focused on how to expand inclusion for women, people of color and LGBTQ workers in jobs that pay a sustainable wage. So why am I listing all of these things off? You might wonder if maybe I just grabbed some random Facebook posts and e-mails to get out of coming up with something to say to you this morning. But I’ve got a reason, I promise — all of these summer updates have a connection to everyone here, because everything I listed came from former students who graduated at least five years ago, and some as far as 20 or more years back. All of them are people whose senior thesis I advised, all of them took multiple courses of mine, and all of them started college as strangers to me. For whatever reason, they picked a course I happened to teach. A few of you students out there will still be in touch with me 5 or 10 or 20-plus years from now, and whoever you are, I look forward to meeting you soon. But more importantly, I hope all of you will be in touch with one or more of your Bates professors for years to come. That’s one of the joys of working here: Every year brings a new group of strangers with fresh energy and fresh ideas to our campus. Every faculty member sitting out there with you has their own stories of former students with whom they’ve developed lasting relationships, connections forged in learning together and sharing a passion for a particular set of topics and commitments in the world. And like me, all of those other professors got started on forming those relationships by watching strangers arrive on campus as new students. Whether you are a professor or a student, right here, sitting within 10 or 20 yards of you, are strangers who will eventually become very special to you. That’s one of the joys of working here: Every year brings a new group of strangers with fresh energy and fresh ideas to our campus. And here we are now, coming together on the day before classes begin for the new academic year, constituting a refreshed and renewed Bates because of everything that you bring with you. Your energy and insights, your talents and life experiences, bring us all a world of new possibilities. Over the summer, while I was enjoying those updates from inspiring former students (and there were many, many more beyond those I shared), you were getting ready to come join us here on campus. And of course one task in that summer prep was to pick out the courses you wanted to take this fall. I bet you pored through the options pretty carefully, and maybe you thought about the professor, but I think it’s more likely you thought about the topics of those courses, each of you picking your own unique combination of subjects you wanted to explore as part of your broad liberal arts education. As you were picking out those courses, we were busy back here too. Bates professors were researching in our labs, creating in our studios, advocating with organizations promoting the public good, gathering evidence in archives or in the field, crunching numbers, writing articles and books, and pursuing all sorts of ideas and action in the many fields we are so passionate about. We were also preparing courses, our paths beginning to cross with yours as we watched members of the incoming class pop up on our online enrollment lists. But you were just names, strangers with whom we would soon share our passion for those many fields. So now it’s time for all of that to really unfold. Throughout move-in and Orientation, I know that you new students have met some of the amazing staff members with whom you’ll also develop transformative relationships. From Dining Services and Facility Services to the Student Affairs staff and the Registrar’s office, from the Harward Center to the Office of Intercultural Education, from Athletics to the College Store and to so many more, these people will be part of your journey at Bates, and you will become part of theirs. You’ve taken a walking tour around Lewiston, and I hope all of you will continue to enjoy the rich history, striking architecture, many cultures and faiths, activities, shops, and restaurants, as well as the natural beauty that your community has to offer. This is your home now in many ways, and you should get out there and get to know it if you aren’t already from right nearby. And for some of you, I know from long experience that you’ll build some of the most transformative relationships of all by getting even more deeply involved in this community: by working with, learning from, and living alongside the many local community members you’ll meet and the many local community initiatives with which you’ll participate. We’re also eager to see how you engage and transform our campus with your fresh energy and perspectives. But my main focus this morning is the faculty angle on all of this, so I especially want to emphasize new relationships with the professors you meet in your courses — the First-Year Seminar that has already met, and the other courses that begin tomorrow and Thursday. Maybe already, maybe tomorrow, but definitely over time, you’ll begin to find the particular faculty members with whom you’ll forge those especially deep bonds. I hope you’re eager to get into the classroom, to get started learning with and from your new professors. And we’re eager for that too. We’re also eager to see how you engage and transform our campus with your fresh energy and perspectives, joining with classmates who’ve been here longer to keep pushing for all that Bates College aspires to be. You’ll throw yourselves into local politics, create art, start organizations and teams or help sustain and transform existing ones, protest inequities and injustices you see right here on our campus and beyond, keeping all of us accountable to our best ideals at this deeply troubling time. As you do all that, you’ll find support from particular professors and staff members, from the broader community, and from your peers, but you will also provide support to all of those people, bringing your own talents and passions into the story of Bates and the story of Lewiston. 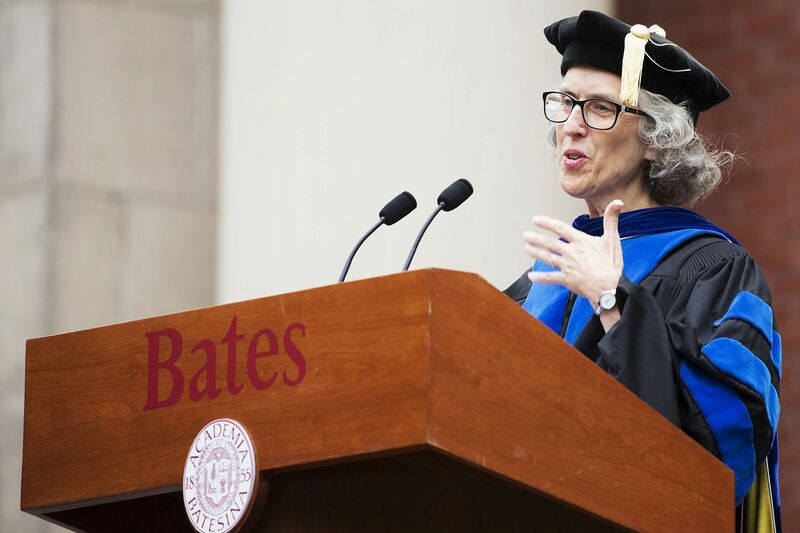 I hope that for many of you new students, the people and places you’ve encountered during Orientation so far have left you excited and hopeful about your future at Bates. But I also know this is a time of complex emotions, a potent mix of anticipation and anxiety, of new possibilities and sadness for what you’ve left behind, of excitement and loneliness and disappointing moments. We’ll all have good times and tough challenges in the year ahead, and it’s a very challenging time in the U.S. and the world. There are lots of faculty, staff, and fellow students who will help you make your way through all of that. But I also know you will offer your own wisdom and energy back to all those other folks as they too navigate life’s complexities and society’s injustices. When I teach a First-Year Seminar, one of the first assignments I give is to ask students to post just three words about Convocation. We discuss those words the next day, and we come back to them again at mid-semester, so we can talk over how the opening excitement is matching up with the more nuanced reality. Several times now, at a reunion I hold for my First-Year Seminar students four years later, just before their graduation, I’ve shared a word cloud of the words they posted, together with some images of their Convocation ceremony. And guess what they say? They say, “What? I don’t remember that assignment!” They don’t really remember much about the specific content of Convocation either. But what they do tend to remember is the feeling of the event, the sense of anticipation and anxiety, that eager readiness to get started. I hope to see many of you new students in my classroom over the next four years, but for the handful of you out there I come to know best, I bet you will be surprised if I remind you that I was the faculty speaker at your Convocation. You will probably say “What? That was you?” But I hope you might vaguely remember feeling a new layer of welcome had been added to the many you’d heard throughout Orientation. And I hope that if I remind you what I talked about, you’ll feel that some of the possibilities I sketched have been realized for you. And of course that’s my hope for all of the faculty and students gathered here today. May you begin, tomorrow and in the semesters to come, to forge new relationships with each other, and among those, find the particularly special ones that will continue on for decades — connections that leave you students wanting to update your former professors on your achievements, your struggles, your moments of joy and your moments of loss, teaching us as much as we taught you. Welcome to you all, thank you for joining us, and best wishes for getting started on those relationships, and all of the other possibilities that lie ahead.